Merced County pensions may have the lowest funding level of any public pension system in California, a shortfall officials attribute to a big retroactive pension increase for all county employees a decade ago and faulty actuarial work. Like most pension systems, the funding level of the giant California Public Employees Retirement System has gone up since a stock market crash in 2008 punched a big hole in investment funds, increasing from about 60 percent to 76 percent. But the funding level of the Merced County Employees Retirement Association has continued to drop since the crash, decreasing from 70.5 percent in 2008 to 51.4 percent last year, despite nearly doubling employer payments into the pension fund. In the latest annual public pension report from the state controller’s office, Merced County stands out with the lowest level of funding in the last reported year, 54.7 percent in 2010-11. “If you do the math, our biggest issue has been that our liability has increased,” said David Ness, who moved from chairman to vice chairman of the Merced County pension board last week. The 4,600-member system owes $1 billion for pensions promised in future decades, up from $692 million in 2008. The projected assets from employer-employee contributions and investment earnings only increased from $488 million to $547 million. Merced County pension fund investments earned an annual average of 6.6 percent during the last 10 years, less than the 7.75 percent currently expected. But two other factors are said to be the main reasons the funding level continued to fall. Ness said a new actuary, Cheiron, found that a miscalculation of growing liability had kept contributions too low. Merced changed actuaries after the previous firm, Buck, had trouble in other counties, notably a lawsuit in neighboring Stanislaus County. “The bulk of the increased liability is the benefit increase,” said Ness. Merced is among several of the 20 county pension systems operating under a 1937 act that gave all of their employees the “3 at 60” pension formula, the most generous in state law except for those reserved for law enforcement, firefighters and judges. The pension increase a decade ago was retroactive to the date of hire, immediately adding to the pension system’s debt or liability. Past employer and employee contributions had been based on amounts needed to pay for lower pensions. “They (pension board) are aware they have issues they need to take care of,” said Steven Bland, the Merced County pension plan administrator. The board adopted a short period, 16 years, to pay off the unfunded liability, which increased annual employer contributions but does not change the funding level. A forecast that retirees will live longer also increased contributions. Last March, the pension board approved one of the biggest rate increases. The annual employer contribution jumped from 44.1 percent of pay to 50 percent of pay, phased in over two years. The Merced County employer contribution, which was $23.7 million in 2008, increased to about $46 million this year. The employee contribution rates are around 9 percent of pay. The actuary, Cheiron, is projecting that rates peaked at nearly 50 percent and will stay near that level until 2028, when they drop sharply. But that assumes investment earnings will average 7.75 percent a year. “Even relatively modest losses relative to the 7.75 percent assumed return could push the employer contribution rate over 50 percent in the next few years,” said Cheiron’s latest actuarial valuation report. A CalPERS-sponsored bill, SB 400 in 1999, is often mentioned by critics of “unsustainable” pensions. While raising state worker pensions, the bill gave the Highway Patrol a “3 at 50” pension formula and authorized local police to bargain for the formula. A follow-up bill, AB 616 in 2001, authorized other local government workers in CalPERS and 1937 act county systems to bargain for three higher pension formulas. The most generous was “3 at 60” (three percent of final pay for each year served at age 60). Backers argued that while SB 400 allowed local police to bargain for a 50 percent increase in pensions, said a legislative analysis, other local government employees received no similar benefit but could, with AB616, get a 33 percent pension increase. The “3 at 50” formula is capped at 90 percent of final pay. The range of pensions under the uncapped “3 at 60” formula goes from 10 percent of final pay at age 50 after five years of service to 120 percent of final pay at age 60 after 40 years of service. Unlike Merced, the largest of the county systems operating under the 1937 act, the Los Angeles County Employees Retirement Association, did not join the wave of pension increases that followed SB 400. The Los Angeles County system has more than a half dozen pension formulas adopted since the 1970s, some coordinated with 401(k)-style individual investment plans. Most are closed to new members now. In the Milliman actuarial report as of June 30 last year, the Los Angeles County system had a 75 percent funding level. The employer contribution rate was 21.34 percent of pay, less than half of the Merced rate of 50 percent of pay. The state controller’s annual report shows that the “3 at 60” formula adopted by Merced County also was adopted by the 1937 act systems in San Diego, Kern, San Mateo and Sonoma counties. 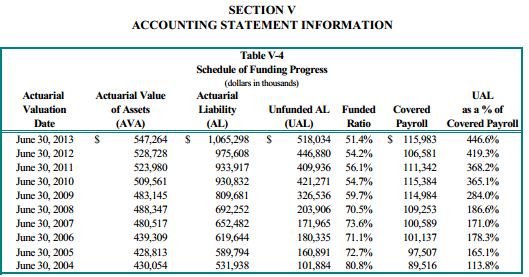 Actuarial reports show San Diego with a 79 percent funding level and 36 percent of pay employer contribution, Kern with a 61 percent funding level and 42 percent contribution and San Mateo with 73 percent funding and a 37.5 percent contribution. The Sonoma County actuarial report shows a market value funding level of 90 percent and an employer contribution rate of 21 percent. But a series of pension bonds and other factors may add to the cost. Sonoma County has been a hotspot for pension activists. Last January the California Public Policy Center published “Sonoma County’s Pension Crisis” by Ken Churchill and New Sonoma, a volunteer group. Another group, Save our Sonoma Roads led by Craig Harrison, urged the federal judge in the Stockton bankruptcy to require the city to cut its pension debt, setting a precedent for reducing the pension costs of other local governments. Harrison told the court the Sonoma County roads are in disrepair because surging pension costs are eating up maintenance funds. U.S. Bankruptcy Judge Christopher Klein rejected the Sonoma group’s filing.